Sacramento County supervisors Tuesday morning approved a new five-story business hotel at Sacramento International Airport, seven years after tearing down the old facility. 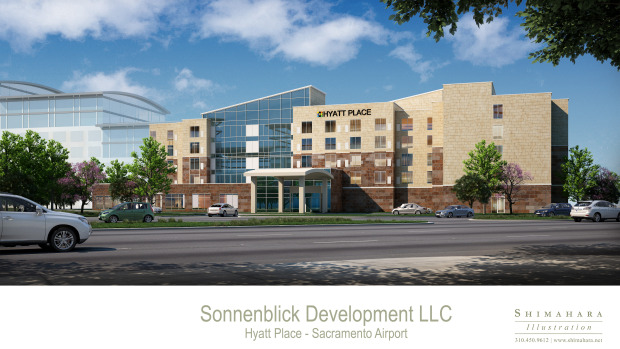 Supervisors voted 5-0 to work with developer Sonnenblick Industries LLC to construct a 135-room Hyatt Place within walking distance of both airport terminals. The hotel will include an indoor pool and spa, fitness room, dining area and 3,500 square feet of meeting space. Sonnenblick has told the county it intends to enter into a “labor harmony agreement” with UNITE HERE Hotel & Restaurant Employee Union Local 49 when hiring workers to operate the hotel, according to a staff report. The developer will pay the airport a one-time fee of $2.46 million for use of 164 ground-floor spaces in the parking garage for guest parking. Sonnenblick will also pay the airport a minimum of $900,000 in total rent across the first four years: $150,000 annually in the first two years and $300,000 annually in the next two years. Thereafter, rent payments will be based on a percentage of hotel gross revenue, estimated at $475,000 in the fifth year. Though they support building a new airport hotel, some supervisors were not impressed Tuesday with the first drawing of the Hyatt Place hotel, telling staff that they want to review the structure’s design in the future. Hotel construction is expected to take two to three years. Sonnenblick is projected to spend about $24 million building the hotel. Bee staff writer Brad Branan contributed to this report.